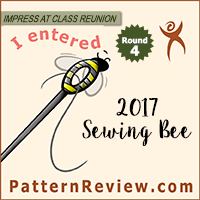 So I did quite a bit of reading while I was gone at nationals, and I’m trying to play catch up on my blog while I’m spending more time cleaning my sewing space than using it, and before work starts up again and life once again gets crazy full. 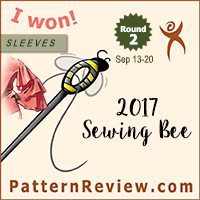 So expect to see a lot of book reviews over the next week or so, because I sure don’t have any new sewing things to show off at the moment. Promise of Blood by Brian McClellan was chosen as the Sword & Laser book club pick for the month of June. Although I didn’t finish it until after the start of nationals (nearly a month late), I have to admit that it really was my hectic schedule, and not the book itself, that led to my slow pace. Promise of Blood is a fantasy story about a French-Revolution-esque uprising in a world where powder mages use gunpowder to fuel their abilities. The revolt is led by Tamas, a soldier who is willing to do whatever he feels is best for the people of Adro. He employs Adamat, a detective, to find out secrets from the previous regime, and to discover who may be trying to bring down his new republic from the inside. He is also willing to exploit the powder mage talents of his son Taniel to keep both him and his new government safe. When I was starting the book it seemed that we were jumping perspectives quite quickly, and I was worried that that it might fall into the trap of too many people with too little personality like a certain other book I’d just read may have done. Happily, while the character introductions are a bit overwhelming up front, the remainder of the story is told from the perspectives of the five or six main characters you meet in the beginning. Which was nice because it gave time to understand their quirks and personality traits, while still having enough points of view to explore the world and see how all the various plot points needed to come together. I enjoyed many of the themes explored in this book – especially toying with the idea that leadership is a divine right. It takes a lot of religious and political tenets that have been displaced throughout history and makes them central plot points in the story. Historical fantasy seems to be increasing in popularity of late, and I have to say the idea of introducing magic and gods into settings like the French Revolution is actually rather enjoyable, and somewhat thought provoking reading. I do have to say that, while I did enjoy this book, I don’t think I was quite as impressed with the writing as I wanted to be. It was good, but it wasn’t brilliant. The problem, I think, is that I’ve read other stories that have attempted similar things, but done them better. The idea for the magic system is cool, but it feels a little unfinished. Like maybe all the rules weren’t quite in place when he wrote it. Of course, it could be that we just haven’t been given all the information yet, but still some things (like the special abilities of the individual powder mages) felt a bit inconsistent. The fight for political power was similarly interesting, but not quite as subtle or complex as I’ve seen in other books. (I mean, if I want a good revolution story I’ll just re-read Les Miserables. Now that is some fantastic writing right there.) Similarly, while I like a lot of the characters (especially Taniel and Ka-poel), I don’t really love them in a way that I’ve loved characters in other fantasy series. Overall McClellan has produced a good story with interesting concepts, but I don’t think this book will go down as being one of my all time favorites. 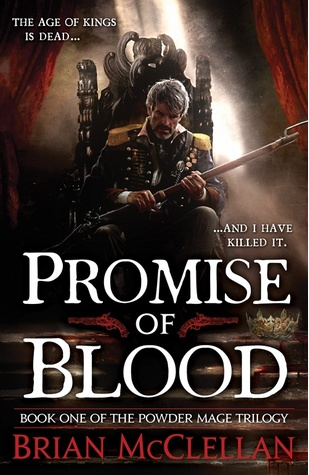 Promise of Blood is only the first book of the Powder Mage Trilogy, and the ending definitely acts more like a set-up for the start of book 2 than as a conclusion for book 1. I think there was enough of interest in this story that I’m willing to spend the time to read the second book and see where things go. The first story leaves a lot of questions about the world and the state of our characters unanswered, so I don’t really feel as though I’ve gotten a satisfying conclusion, and I’m invested enough with these characters to care about finding out what happens to them. So I expect I will read the other books in the trilogy at some point, though I don’t feel the need to rush out and power through them right away. Definitely on my long-term list of to-read books though. In the end I would say that I give this book a “maybe” recommendation. If you love fantasy then I think this story deals with some common tropes in an interesting way, and it is probably worth the read just to keep up with the modern authors and stories in the genre. Otherwise… I might say that you can give this book a pass. I think there are better fantasy series out there at the moment, with more compelling characters, more complex worlds, and more sophisticated writing. This book was good, and worth the read if you decide to pick it up, but I also think you can skip it without missing out on too much.